Welcomed as the newest patron of the Arts Council of Menifee. Photograph received the award for Top 5% in the People category for the month of January 2015 by Pixoto Members. Photograph was published and selected as "Best of Group Award for Senior Photography" by Inspire- Digital or Not Fine Art Photography Magazine!! Selected as a finalist in the National Art Museum of Sport (NAMOS) 4th Annual International Fine Art Competition, Commitment to Excellence in Art & Sport." Chosen photograph will be on exhibit at NAMOS from September 4 through November 3, 2014. 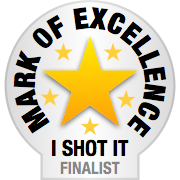 Photograph was selected as the winner of the "I SHOT IT" national competition and received the Award of Excellence. Selected as a nationally recognized MaxPreps Sports Photographer. Two photographs were chosen to be in the top tier of the San Diego County Fair Photography Exhibit and will be on display from June 16 through July 4th, 2014.